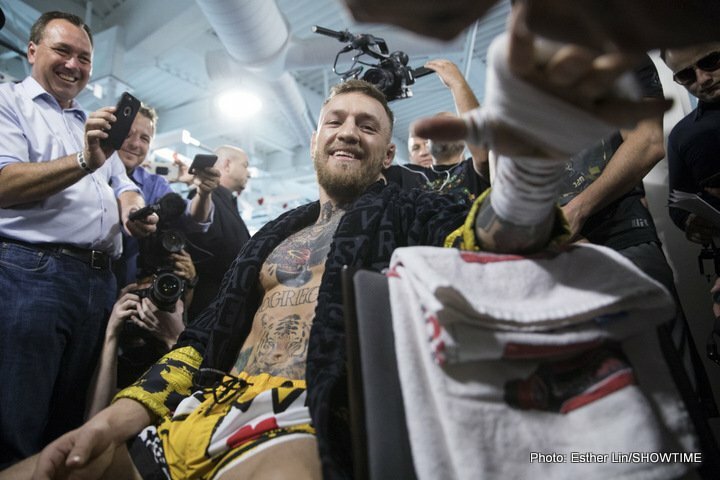 As fight fans now have a chance to see a short (very short) clip of the sparring sessions we’ve heard so much about, between Conor McGregor and Paulie Malignaggi, they also have a chance to listen to the MMA star’s latest prediction regarding his August 26 showdown with Floyd Mayweather. Regarding the short clip of the sparring sessions: the clip does show Malignaggi going down, yet he appears to be off-balance and also helped down by a forearm, and the second the clip ends, Malignaggi is in the act of bouncing straight back up, clearly unhurt. Still, McGregor and his supporters are using the video clip as “proof” that he can box and that Mayweather will be in trouble, as was Malignaggi. But whether it’s eight or ten ounce gloves on August 26, McGregor is predicting a KO win either way. Big money has been betted on the upcoming fight, but despite all the talk, all the hype and all the fuss, many fans remain as convinced as they were when the fight was first announced that there is no way a great boxer like Mayweather will possibly lose to a man making his boxing debut. McGregor has vowed to win and then take over boxing. It’s now up to Floyd to put his vocal challenger in his place.